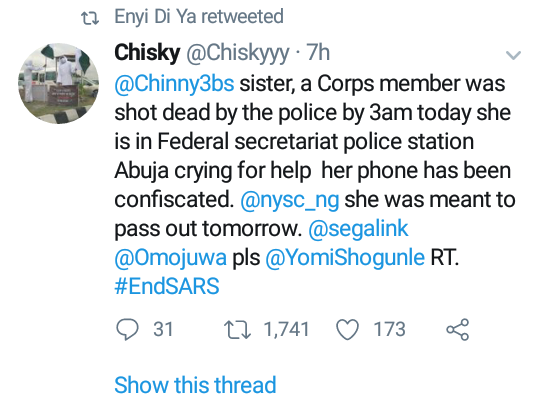 SARS officer allegedly kills female corps member who would have passed out tomorrow in Abuja (graphic photos) ~ Nigerian news platform bringing you News in Entertainment, Politics, Sports & Lifestyle. A female Corp member named Linda Angela Igwetu was allegedly shot dead by a SARS officer in the early hours of this morning in Abuja. Linda, who would have passed out tomorrow, hung out with friends last night to celebrate her passing out and left for home early this morning. On her way home, a police officer shot at the car she was in and she was hit. Linda was immediately rushed to Garki hospital but they refused to treat her until they see a police report, despite police officers being present. The young corper eventually bled to death. Read the full account of what happened as told by the deceased's sister and brand consultant Segun Awosanya below.